Philip Merrill was the patriarch of the Merrill family in western Maryland. He established his family on lands in Allegany County at the turn of the 19th century. Over the next three decades, he would expand his land holdings and raise his children from two marriages. Two sons would establish farms near Oakland and Avilton in what would become Garrett County. Other children would migrate to Iowa and Pennsylvania. Late in life, Philip Merrill would dispose of his lands and possessions and move westward to Preston County, (West) Virginia, where he likely lived out his days near Kingwood. Multiple published accounts trace Philip Merrill’s ancestry to Richard Merrill “The Immigrant” (1642-1727) who left England for Staten Island, New York, sometime after 1679. The line of descent proceeds through Philip Merrill (1679-1739), then Nicholas Merrill (1728-1795), the father of our subject. Various authors report the birthplace of Philip Merrill as Morris County, New Jersey. He apparently migrated to Loudoun County, Virginia, before settling in Maryland at “Wills Town” prior to 1800. The author has not substantiated this history with any primary or secondary sources to date. There has been frequent misidentification of Philip Merrill of Allegany County in genealogic databases and family trees. The individual often confused with our subject is a Philip Merrill born in 1762 in St. Mary’s County, Maryland. This Philip Merrill appears to have been a distant cousin of our subject, descending from Richard Merrill (1642-1727) “The Immigrant” through his oldest son William Merrill (1688-1714), then Philip Merrill (1700-1744), and finally Joshua Merrill (b.1730). Philip Merrill’s marriage to Monica Truman in 1798 in Prince George’s County, Maryland, has been documented. The birth date, place of birth, and marriage information are often incorrectly attributed to our subject. The only years that satisfy all of the five census listings are 1769 and 1770. Therefore a recommendation is made that “about 1770” be utilized for the birth date of Philip Merrill of Allegany County until more definitive evidence of date and place of birth becomes available. The first documented evidence of Philip Merrill living in Maryland is found in the 1800 U.S. Federal Census, where he is listed as living in “Wills Town”, likely with his wife, three males under age 16, and three females under age 16. “Wills Town” is a historical designation for the region extending from Cumberland on the Potomac River northwards to Pennsylvania following Will’s Creek. The “Wills Town” district included the land along Jennings Run from Corriganville to Barrelville, and also the territory of present-day Mt. Savage and Frostburg. Philip Merrill was living in that part of the “Wills Town” district immediately north of what would become Frostburg. An analysis of his neighbors in the 1800 census shows that most of them continued to be listed in this district in the 1810 and 1820 federal census records. This makes it unlikely that he moved any significant distance, if he moved at all, from the site where he originally settled in Maryland before 1800. The land records of the Allegany County Court document the purchase of “Ridge” by Philip Merrill from Philip Hammond for $200 in November 1805. “Ridge” had been patented by Philip Hammond in 1804 and included Military Lot No. 3636 as well as 19 ½ acres of adjacent “vacant” land, making 69 ½ acres in total. The patent also lists “Improvements thereon” including 600 fence rails and a “Cabbin”. Philip Merrill’s first wife, whose identity is not known, appears to have died between the taking of the census in 1800 and his purchase of “Ridge” in 1805. Philip Merrill likely married Margaret Perry shortly after his purchase of the “Ridge” farm, as her name is not recorded on the deed. Beginning with the birth of William Phillip about 1807, the couple would have several children while living in this region. Their growing family is enumerated in the census records of 1810, 1820, and 1830 for this district of Allegany County. During this time Philip and Margaret Merrill would add adjacent properties to their land holdings, including Merrils Ville (10 acres) in 1806, Military Lot No. 3635 (50 acres) in 1815, Mount Misery (Military Lot No. 3637 containing 48 ½ acres), and two parcels of Williams Sheep Walk (31 5/8 acres total) in 1836. Philip Merrill and his first wife, whose identity is not known, had at least four children by the time of her death, being sometime after 1800. The oldest child appears to have been Lydia Merrill, born about 1785, probably in Loudoun County, Virginia. Lydia would marry Isaac Workman on January 13th, 1810, in Allegany County. The first son, Jesse Merrill, was reportedly born on August 3rd, 1788, in Loudoun County, Virginia. He came to Allegany County, Maryland with his family, but left home for Washington County, Pennsylvania after his mother’s death. He was 17 years old. There he married Nancy Hemphill in 1811. The couple would later move to Ohio, initially farming in Belmont County, and then later establishing themselves in Harrison County where Jesse served in the county government. In 1855, having raised 10 children, the couple moved to Buchanan County, Iowa. Jesse was active in his church and in 1859 donated the land for the construction of Liberty Church and the Hickory Grove Cemetery, where he and his wife were buried. Nicholas Merrill was born about 1800 in Allegany County. He would marry Elizabeth Frost, daughter of their neighbor, Isaiah Frost, on April 19th, 1825. After 1830, the couple relocated to Monongahela Township, in Greene County, Pennsylvania where her father owned property. They remained in this community the rest of their lives. Stephen Merrill was born about 1800 as well, but it is not known whether before or after his brother Nicholas. Stephen was raised on the “Ridge” farm and married a local girl, Catherine Workman. Following the births of their first three children, the young family set out for the Glades country in western Allegany (now Garrett) County. They established a 200 acre farm on Hoop Pole Ridge and raised eight children to adulthood. Stephen died in 1883 and was buried in the family cemetery on the farm. Margaret Perry was the second wife of Philip Merrill. They married about 1805 and continued to live on the “Ridge” farm in Allegany County. Their first child was born about 1807, William Phillip Merrill. He would marry Francenia Holtzman. They would have eight children. Andrew Merrill was born about 1809. He did marry and had at least five children. John Merrill was born in 1810. He married Eleanor Weitzell from New Germany in Allegany County. They would have eleven children. The family settled on land near Avilton, in what is now Garrett County. John Merrill was a founding member of the Cherry Grove Church of the Brethren in this community. He died at age 48 years, and was buried in the Merrill Cemetery on Pea Ridge, about 1 ½ miles south of Avilton. Joseph Merrill (born about 1815), Drusa Merrill (born about 1820), and Catharine Merrill (born about 1820) were noted in records from Preston County, where Philip Merrill relocated prior to 1840. Few records have been found for these individuals, as courthouse records for this county were destroyed by fire in 1869. Catharine Merrill appears to have married George Rhodes of Preston County and settled there. Joseph is listed as living with his mother in Preston County in the 1850 census, following his father’s death. The “Merrill Farm” located on Pea Ridge, near Avilton, was never the home of Philip Merrill. This was the home of his son, John Merrill, born in 1810. He settled there after his marriage to Eleanor Weitzell. The property was inherited by John’s eldest son, William H. Merrill. Another son of this couple, Elias Merrill, established his farm further south at the base of Pea Ridge on the Savage River. Despite published reports to the contrary, Philip Merrill never resided in this community and was not buried in one of the family cemeteries. In 1837 the land records of Allegany County record the transfer of all of the properties of Philip and Margaret Merrill to Daniel Cobb of the City of Baltimore for four thousand dollars. “Ridge” and many other surrounding properties would eventually be consolidated and acquired by the Borden Mining Company (coal mining). Philip Merrill likely died on the Preston County farm after 1840. 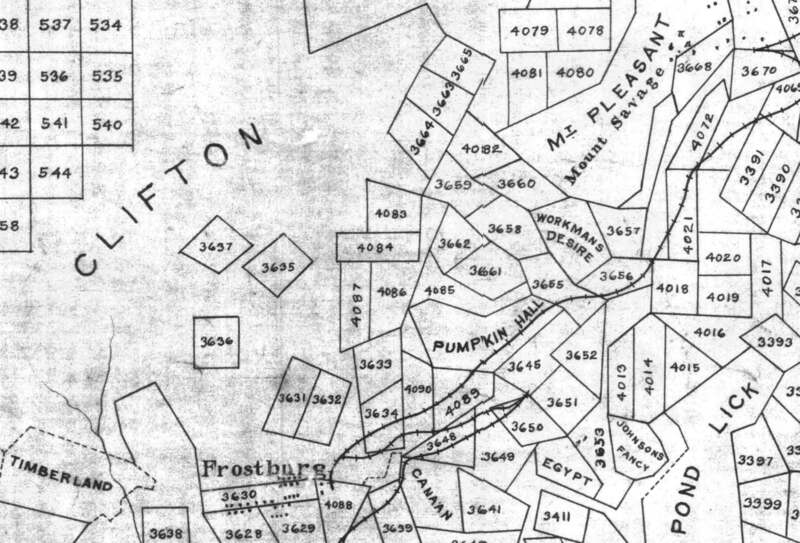 The 1850 census finds Margaret and son Joseph in Preston County with a farm valued at $2000. Philip’s death and burial are not recorded in the records of Preston County as no records are available for this county prior to 1869 due to their loss in a courthouse fire. Philip Merrill was responsible for establishing the Merrill family in western Maryland, where many descendants continue to live today. Research continues on this family line, and the Merrill family history will continue to evolve as new facts come to light and are added to this record. You have done a beautiful job on this article. Heading to Pea Ridge with a few cousins to show them the David Merrill, son of John and Eleanor, homestead. David and his wife, Mary Elizabeth Beeghly , were originally buried there, but their graves were relocated to the Grantsville Cemetery. We descend from David’s and Mollie’s daughter, Margaret Edith Railey. Elizabeth Frost, who married Nicholas Merrill on 19 April, 1825, moved to Dade Co., Missouri sometime after her husband died (sometime before 1860). She died on 26 August, 1886, in VanBuren Township, Newton Co., MO, and was buried in the Black Fox Cemetery there. Her daughter, Anna Mariah Merrill was my great-great-grandmother. She was married to Joseph H. Kistler in 1870. Thanks for adding this information, Jerry. I find Elizabeth Frost Merrill in the 1870 US Census in Dade County, Missouri, living next to her daughter, Mariah. I also found a memorial on Find-A-Grave with photos of the grave marker for Elizabeth Merrill with the date of death you provided. However, the cemetery is called Van Buren Union Cemetery. Is this correct? Thanks again for the additional information on my Merrill line. Thanks for that information, Jerry. Who were Elizabeth’s parents? It’s not my line, but I’m curious. I have Elizabeth Frost being the daughter of Isaiah Frost and Sarah Neff, both of Allegany County, Maryland. Isaiah and Sarah would later move to Fayette County, Pennsylvania, where Isaiah died in 1848. Nicholas and Elizabeth followed them to Pennsylvania, where Nicholas died before 1860 in Greene County, Pennsylvania. Wow, I wish I would have found this a while ago! Thank you so much for all of the information. I am not exactly sure yet how I’m connected to Merrill family but I have a number of 4-6th cousin matches for Merrill descendants that do not seem to be connected to my branch of the Workman family. My 4th great grandfather was Amos Workman, descendant of Abraham/William. He was born near Frostburg about 1765 and married an unknown Rebecca in 1786 in Maryland. Rebecca disappears from records completely other than that we know they had at least one son, Isaac who is my 3rd great Grandfather. The more research I do, the more I think that Rebecca was connected to either the other branch of Workmans, or possibly the Merrill or Robeson families- I have a huge number of fairly close matches to Workman/Robeson families as well. I have read the article on Stephen as well. I’ve been trying to figure out the Workman/Merrill connection for a while with little luck! I believe I’ve figured out much of the Workman/Robeson connection and how it would end up connecting to my Workman branch but the Merrill connection is still a huge puzzle. Guess what? Last week, a Garrett Co, MD woman saw a photo I posted on a Garrett Co memories Facebook page of a 2009 Merrill reunion we had in western MD. She wondered if her Merrills were related. It turns out, after we did a bit of talking, that her granddad was Stephen Austen Merrill, son of Isaac Newton Merrill, son of Stephen. I haven’t seen proof of first or second wife as mother. Most folks think Catherine Workman. She is interested in her past. She has nice photos of Aus, as he was known and now knows abt Isaac Newton’s early death and his leaving behind five children. I’ve been working with her. We need to connect! I’ve done family tree, ancestry, 23 and me. It is great to see these comments. Thank you. At first I thought the dna connection might be just a random incident, or coming through one of the Workman family members in Virginia. As more people have done dna testing, I have got more and more matches to the Merrill family, and their respective trees are showing no connection to Workman lines other than possibly just being in the same area. Because of this I do think the connection is coming prior to Catherine Workman’s marriage to Stephen Merrill. I do have one fairly strong match to a descendant of Catherine/Stephen. The other matches are to descendants of John Merrill and Catherine Merrill Rhodes. I’m also showing a couple of matches connected to Lydia Merrill/Isaac Workman- those matches would be more expected than the other ones. The one other possible connection or link between parts of the families that I’ve found is their religion. The Workman/Robeson branch that went on to Ohio was connected to the Dunkard German Baptist/Church of the Brethren. This would be the same church that John Merrill family was connected to. It’s extremely difficult to find information on the early congregations/groups though so I have not been able find a specific connection between John Merrill’s group and Joseph Channing Workman’s group. As far as I have been able to piece together, at one point Lydia Merrill Workman and her husband would have been living on land that Joseph Channing Workman owned in Ohio. This would have been after he became a member of Church of the Brethren. I believe that the two groups may have been originally connected to one of the early Church of the Brethren communities in Maryland then John went to Virginia and Joseph Channing Workman went on to Ohio. I’m a John Merrill descendant through son, David Michael and Mary E. ” Mollie” Beeghley to Margaret Edith Merrill M. Charles Mahlon Railey (born Mahlon John Raley). So we have ties to Cherry Grove Church of the Brethren through both the Merrills and Beeghleys. I’ve been surprised abt the German Weitzels and Beeghleys marrying Merrills. Having retired 9 years ago at age 60 to work on regional and family history and have a bit more free time for family, I now live about 25 minutes from the Avilton/Pea Ridge homestead and about 8 miles from Garrett County, MD and the same to southwestern Pa, it’s a great location for research. Beverly, I wondered about how the Workman families became involved with Church of the Brethren. When I researched the early history of the church, I found that they established communities in Maryland probably near where the Merrills and Workman families were living. in the late 1700s/early 1800s the church was actively recruiting members so the only thing I can think of is that Merrill, Robeson and Workman family members may have attended some of their gatherings and converted. After converting, they would have married other church members, many of whom would have been of German descent as the church/religion originated in Germany. My ancestor Amos Workman supposedly went from Frostburg to Monongalia county before going on to Ohio then Illinois. There is little information about him and I have spent years piecing together his family connection and his possible history. Luckily, I have found people in the Maryland and Virginia areas that have been a great help sharing what they know about the area and the early family histories. The dna matching has been the biggest help. Before that, no one was even really sure that he was even part of the larger Workman family because few people could find any information on him. That’s great. I live in between Garrett County, MD and Monongalia County, WV. I’ll keep my eyes open. I believe the dna research is extremely useful, probably essential in figuring out some of the family puzzles and brick walls. I think it is about the only way I am going to find any clues to who my 4th great grandmother Rebecca was or how/why my Workman branch is so closely connected to a distant Workman branch that should not even register dna connections! My one problem with the dna circles on ancestry is that many people do not understand how it is set up to work and/or do not make use of it’s capabilities. I am also at the point where I wish ancestry would give us a chromosome browser which would make it a little easier to tell who or where the match is coming from. I have uploaded my results to other sites that do offer the chromosome browser in order to help with the dna research and it is helping a little. Now, I just have to try to convince a few more of my closer Merril descendant matches to upload to one of the other sites so I can get a better comparison to verify the chromosome matches. I also need to find time now to sit down and focus on putting together all of the research I’ve done so far to share it with everyone.